In a stunning move just days before the Premier League season begins, Everton may have pulled off the steal of the summer. After being heavily linked to Manchester United, Yerry Mina has signed with the Toffees for a reported £27.19million. Joining him from Barcelona is Portuguese teammate Andre Gomes, who signs on a season-long loan. The Spanish champions reserve the right to buy Mina immediately back but Gerard Pique and Samuel Umtiti anchoring the defensive line, it would take a serious injury or a standout season from Mina to convince Barcelona to take him back. The 23-year-old had an impressive World Cup, scoring three goals in three appearances, including a 93rd-minute equalizer against England in their Round of 16 clash. While the Colombians would go on to lose that game on penalties, Mina had left a strong impression on the rest of the world. With two clean sheets from his three appearances, he easily caught the eye of new Everton boss Marco Silva. Mina hasn’t had much of a chance to shine with Barcelona, featuring in just six games, playing a total of 377 minutes. The centre-back signed from Brazilian side Palmeiras in January this year for £10.44million, meaning Barcelona have made a decent £16.75 million profit off a player who barely featured for them. Joining Mina on the blue half of Merseyside is Andre Gomes who signed on loan for the 2018/19 season. The 25-year-old has been with the Catalan giants for slightly longer than Mina, having signed in mid-2016 from Valencia. The Portuguese playmaker has featured in 78 games for Barcelona, scoring three goals and setting up another four. 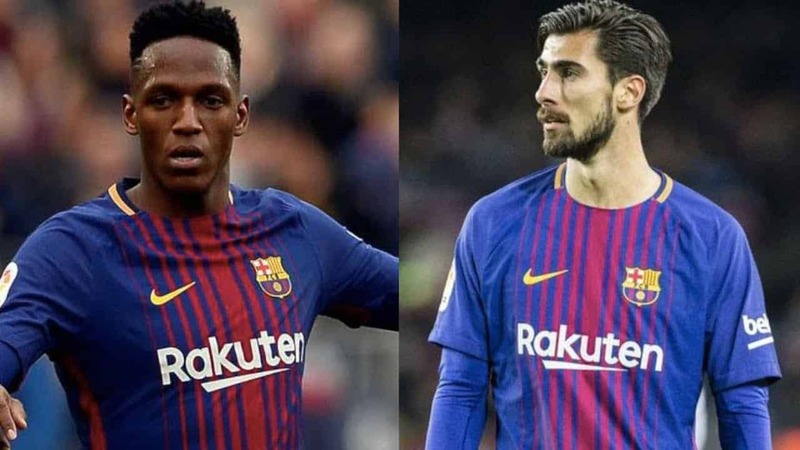 Given Barca’s dominant midfield, it was tough for Gomes to crack the first team as he’s only averaged just under 50 minutes of action per game. Astonishingly, he’s only played a full 90 minutes just 18 times since signing, with six of those coming in the Copa del Rey. The midfielder explained that Marco Silva was a big factor in joining the Toffees, who have now spent more than £60 million in less than two weeks. Gomes will be joining former Barca teammate Lucas Digne, who joined in early August. In their final piece of business for the day, the Toffees also snatched up Brazilian international Bernard, who was out of contract after leaving Shakhtar Donetsk after five years with the Ukrainian side. The diminutive winger played in 157 games, scoring 28 goals and picking up 35 assists. The free transfer is another huge signing for Everton as the 25-year-old has played for Brazil 14 times and will certainly help the midfield who has now lost Davy Klassen to Werder Bremen. “The manager made me feel confident about playing here. He has achieved really good things at other clubs. Everton open their Premier League campaign away from home as they face the newly promoted Wolves side, fresh off their own incredible summer transfer window. Read more football news here as we recap Joe Hart’s departure from Manchester City and don’t forget to let me know your thoughts on Twitter!